Or view larger version. Bring the monster down: End the air war. 1972. Doug Lawler, artist. Poster. Collection of Oakland Museum of California, All of Us or None Archive. Gift of the Rossman Family. 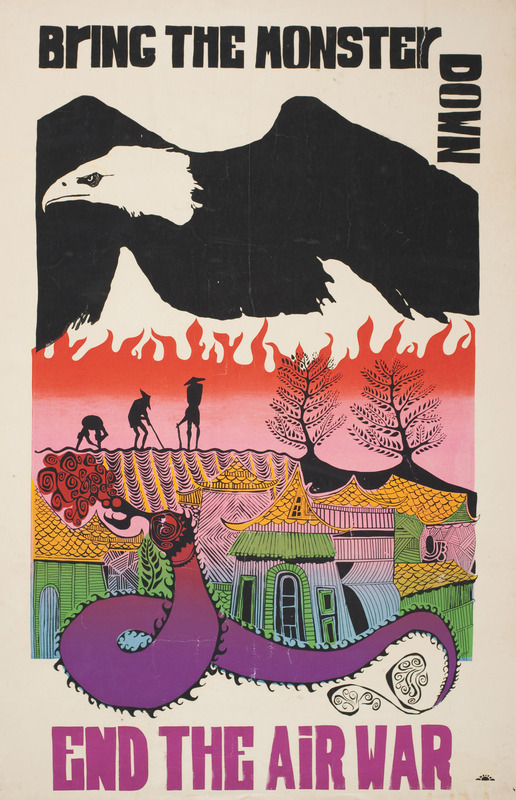 This screen-printed poster portrays a grim American eagle raining fire down on peasants struggling to maintain their traditional way of life; the artfully composed hand lettering reinforces the title’s text. The escalation of “carpet bombing” in the Viet Nam war that began in 1970 resulted in a proliferation of artwork such as this one, produced by the East Bay Media Center collective.